Look at the cute little family. 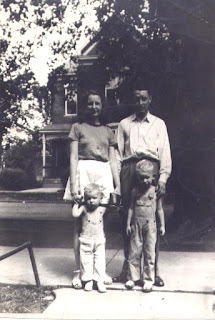 This is Nana and Boppa with my dad Mike, age 4, (in front of Boppa) and my uncle Bill, age 2, (in front of Nana). The back of the picture says “The Doctor out There” and is dated September of 1947. My dad says they were living in San Angelo, Texas at this time, but I’m not sure if this is where the photo was taken. If any of you family members know, please comment! Casseroles were also easy for busy moms and using new convenience foods was the new modern way to cook. 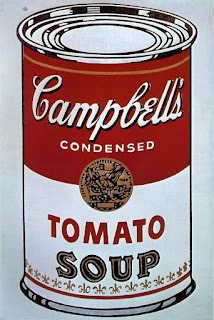 Using canned soups also gained popularity because of their ability to stretch a meal and their low prices during the Depression. I’m not showing you the grocery list yet. BUT–first, cook some chicken and either shred it or cut it into bite-sized pieces. I used a big package of chicken thighs. More economical than breasts and they don’t dry out. You’ll also need to make the sauce and set it aside, grate some cheese, and chop some corn tortillas into small pieces. You can make two smaller casseroles, like I did, or just use a 9×13″ Pyrex pan. For the larger Pyrex, divide the tortillas in half and layer half in the bottom of the pan. For two pans, divide into 4 parts. Do the same with the chicken. Layer it over the top of the tortillas. Divide the sauce the same way. Pour it over the chicken layer, then sprinkle some cheese over. Lather, rinse, repeat. You know, rather like a lasagna. Finish with a top layer of cheese, then pour on some green salsa. Until bubbly and browned on the edges. Pair with a nice salad and your’e good to go. Alright, are you ready for the soup? 4 whole chicken breasts or 1 whole chicken plus another whole breast--Cooked and shredded, or cut into bite-sized pieces. Mix soups, evaporated milk, 2/3 jar of salsa, and sauteed onion in a bowl and set aside. Begin layering the casserole, similar to a lasagne. Repeat another layer of all, ending with cheese. Top with remaining salsa. Bake at 350* for one hour. Let sit for 15 minutes before cutting.